This article is about the Monster Energy NASCAR Cup Series driver. For other people named Jimmie Johnson or Jimmy Johnson, see Jimmy Johnson (disambiguation). Jimmie Kenneth Johnson (born September 17, 1975) is an American professional stock car racing driver and a seven-time champion in the Monster Energy NASCAR Cup Series. He currently competes full-time in the Monster Energy NASCAR Cup Series, driving the No. 48 Chevrolet Camaro ZL1 for Hendrick Motorsports. He moved to Hendrick Motorsports in the Winston Cup Series in 2002 (now Monster Energy Cup Series). After finishing fifth in the points in his first full season, he was second in 2003 and 2004, and fifth in 2005. Johnson won his first Cup Series championship in 2006 and with further wins in 2007, 2008, 2009, and 2010, he became the first and only driver in NASCAR history to win five consecutive championships. Johnson finished sixth in the points standings in the 2011 season and third in 2012 before winning his sixth championship in 2013. In 2016, Johnson won his seventh championship, tying Richard Petty and Dale Earnhardt for the most Cup Series championships of all time. Johnson is also a two-time winner of the Daytona 500, winning in 2006 and 2013. Between 2002 and 2017, Johnson has recorded seven championships, 83 career race wins, 221 top fives, 342 top tens, and 35 pole positions. Johnson started racing motorcycles in 1980 when he was four. Three years later, he won the 60cc class championship, despite having an injured knee. Afterward, he moved to the Mickey Thompson Entertainment Group (MTEG) Stadium Racing Series where he won several more awards. In 1993, Johnson was given the opportunity to drive for Herb Fishel. He refused the deal and continued racing buggies and trucks in off-road stadium and desert races. He also reported for ESPN in the Short Course Off-Road Drivers Association (SODA). Three years later, Johnson drove for Herzog Motorsports in the off-road truck series in 1996. By 1997, Johnson had progressed to SODA's Class 8; Class 8 is short-course off-road racing's class of two-wheel-drive Trophy Trucks which generate about 800 horsepower. He battled Scott Taylor and Brendan Gaughan for the championship. That year, Johnson won both races at Lake Geneva Raceway's first race weekend in May. He also won the season's third event at Antigo before finishing second to Gaughan at Antigo's second race. Johnson returned to Lake Geneva in July, winning the Saturday race and finished 2nd on the following day. Taylor ended up winning the championship with Gaughan second and Johnson third. During his time in the SODA, SCORE and MTEG series, he accumulated over 25 wins, 100 top-three finishes, six championships, and received Rookie of the Year honors in all three leagues. In 1998, he began racing on asphalt ovals when he entered the American Speed Association (ASA) as well as part-time in the NASCAR Busch Series (now Xfinity Series). In the same year, Johnson won the ASA Pat Schauer Memorial Rookie title. One year later, he had two wins and finished third in the standings. In 2000, he was announced the driver for Herzog Motorsports in the Busch Series. During the season, he had a spectacular accident on lap 46 during the Lysol 200 at Watkins Glen when his brakes failed entering the first turn. He had to swerve quickly to the right to avoid the 86 of Dennis Demers, but went into the grass on the inside of turn one, then went back across the track, caught some air on the gravel trap before finally crashing head-on into the carafoam barriers at the far end of the turn while still more than 150+ MPH. Many feared that this accident could have resulted in career ending injuries or potentially have killed him, but he climbed out of the car unscathed and raised his fists in the air like he'd won the race, much to the delight of the crowd. Otherwise, in a rather uneventful season which featured one DNQ at Daytona and six top-10s, he finished tenth in the point standings. During the 2001 season, Johnson recorded one win, which was at Chicagoland Speedway, and finished eighth in the point standings. He also began racing in the Winston Cup Series (now Monster Energy NASCAR Cup Series) for Hendrick Motorsports. In the following season, Johnson left Herzog Motorsports to move to Hendrick Motorsports in the Winston Cup Series, driving the No. 48 Lowe's Chevrolet. Johnson began racing full-time in the Winston Cup Series during the 2002 season. He earned his first career pole position for the Daytona 500, becoming the second rookie to do so (the first was Loy Allen Jr. in 1994). In his 13th career start, Johnson scored his first career win in the NAPA Auto Parts 500 at Auto Club Speedway. Johnson became the first rookie driver to lead the point standings and to win twice at the same track during a season, by sweeping both races at Dover. He recorded four pole positions and three wins (tying the rookie record set by Tony Stewart in 1999), as well as six top fives and twenty-one top ten finishes. He finished fifth in the final point standings. During 2003, Johnson finished ninth on the all-time list for consecutive weeks ranked in the top ten in points with 69. He won three races (Coca-Cola 600 at Charlotte and both New Hampshire races), two poles (at Kansas Speedway and Pocono Raceway), fourteen top fives, and twenty top ten finishes. He also was able to win the All-Star race for the first time, as well as finishing second with just 90 points behind Matt Kenseth and 207 ahead of his future teammate Dale Earnhardt, Jr. In 2004, Johnson started slowly at Rockingham Speedway and Las Vegas Motor Speedway with results of 41st and 16th, after a top ten finish in the Daytona 500. However, he quickly was able to rebound winning the Carolina Dodge Dealers 400 at Darlington Raceway. Subsequent victories in the Coca-Cola 600, the Pocono 500, and the Pennsylvania 500 came in the middle of the season, seeing Johnson sweep the Pocono races. However, finishes of 37th and 32nd at Talladega Superspeedway and Kansas moved him toward the bottom of the point standings. Afterward, he was able to win the UAW-GM Quality 500 at Lowe's Motor Speedway. The second victory of the 2004 Chase for the Nextel Cup, at the Subway 500 at Martinsville on October 24, 2004, was marred by tragedy. Owner Rick Hendrick's son Ricky, twin nieces, brother, and chief engine builder Randy Dorton as well as Joe Turner, Scott Lathram were killed in an airplane crash en route to the race. All eight passengers and both pilots died in the incident, and Johnson was told after completion of the race. Johnson had a total of eight wins, 20 top five and 23 top ten finishes. At the end of the season, Johnson finished second in the point standings. In 2005, Johnson won at Las Vegas, Lowe's Motor Speedway, Dover International Speedway, and then again at Lowe's. In total, Johnson had four consecutive wins at his sponsor (Lowe's) sponsored track in Charlotte, North Carolina. Johnson had a chance to win the championship coming into the November 20 season finale at Homestead-Miami Speedway, but finished 5th in points after crashing at the midway point of the event with a tire problem. He scored 13 top-fives, 22 top-10 finishes, and one pole position. In 2006, Johnson began the season by winning the Daytona 500. He finished second in the next race at California Speedway and won the UAW-DaimlerChrysler 400 at Las Vegas. Johnson won his third race of the season in the Aaron's 499 at Talladega, followed by two more victories at Indianapolis and Martinsville Throughout the season, he became the only modern era driver to win at least three races in each of his first five seasons. At the end of the season, he recorded one pole, 13 top fives, 24 top tens, and his first championship title (this was also the first in his NASCAR career). In December, Johnson won the 2006 Driver of the Year Award. During the 2007 season, Johnson continued on a streak and recorded 10 wins, four poles, 20 top fives, and again 24 top ten finishes. Those 10 wins included sweeping both races at Richmond, Atlanta, and Martinsville. He also won at Las Vegas, Auto Club, Texas, and Phoenix. Afterwards, he won his second consecutive championship title and was named the 2007 Driver of the Year. Johnson also had the best average finish in the Chase with 5.0. At the end of the season, he had a total of 33 career wins, placing him 18th on the all-time wins list. In December 2007, Johnson commenced a program of exercise sessions and a run schedule supervised by John Sitaras, in order to balance his strength. Sitaras' initial assessment found that half of his body was much tighter, having acclimated to offsetting the g-force load from turning left while driving. In two years, Johnson's body fat percentage dropped from 20% to 8% (visible also in the change of the shape of his face), while his strength and stamina greatly improved. Johnson later became the first racing driver to be named Associated Press Male Athlete of the Year (in 2009). After the 2008 season, Johnson became the second driver to win three consecutive NASCAR Cup Series championships, the first being Cale Yarborough. During the season, he won seven races (including a sweep at Phoenix), a career high of six poles, 15 top fives, and 22 top tens. In five of those seven wins, he started from the pole. He became the only driver to record three wins in each of their first seven seasons. In the Chase for the Championship, he recorded 14 wins, eight more than any other driver. He also was named the 2008 Driver of the Year and won an ESPY as the Best Driver. After the season, he also moved to third on the active winners list. In the 2009 season, Johnson recorded his fourth consecutive championship, becoming the only driver to win four back-to-back season titles. Throughout this season, he won seven races (including a third consecutive Checker Auto Parts 500 and both Dover races), four poles, 16 top fives, and 24 top ten finishes. Johnson now became the only driver to win at least three races in each of his first eight seasons, as well as the only driver to qualify for the Chase for the Championship every year since 2004. During the season, he moved up one spot up to second on the active winners list and went to 13th on the all-time wins list. After the season concluded, he won an ESPY for the second consecutive year, and won the Driver of the Year award for the third time, tying Jeff Gordon, Mario Andretti, and Darrell Waltrip as the only three time drivers to win the award. During 2010, Johnson won his fifth consecutive championship, becoming the third driver who made up points to win the title since 1975. During the season, he scored two poles, 17 top fives, 23 top tens and six victories. He also remained the only driver to qualify for the Chase every year since its inception in 2004. He became the 12th, and currently the last driver, to win 50+ NASCAR races when he won at Bristol in March, and went up to 10th on the all-time wins list. Johnson was also named Driver of the Year for the fourth time in his career, joining Gordon as the only drivers to win the award that many times. He also won Tony Stewart's charity race, the Prelude to the Dream, his first victory on a dirt oval. In 2011, Johnson began the season with a fourth-place finish in the Budweiser Shootout, after starting from the 23rd position. One week later in the 2011 Daytona 500, he started 23rd, but finished 27th after being involved in a crash on lap 29. During the Subway Fresh Fit 500, he managed a third-place finish. Following a 16th-place finish after the Kobalt Tools 400 he collected two consecutive top-five finishes. Statistically, Johnson's 2011 season was one of his worst performances to date, even though he finished sixth in the points. He only won two races during the season. The first was the Aaron's 499 at Talladega Superspeedway, where Johnson started on the outside pole, and tandem-drafted with Dale Earnhardt, Jr. for the entire race. On the last lap, with Johnson in front, he and Earnhardt, Jr. were in fifth and sixth off of turn 4, behind two other pairs of cars - their Hendrick teammates Jeff Gordon and Mark Martin, and the Richard Childress drafting pair of Clint Bowyer and Kevin Harvick. In the tri-oval, Earnhardt, Jr. gave Johnson enough of a push to nip Bowyer at the finish line by 0.002 seconds. This was the closest recorded finish in Talladega history, and tied the 2003 Carolina Dodge Dealers 400 for closest margin of victory in NASCAR history. After finishing in the first 15 positions in the next four races, Johnson failed to finish the Coca-Cola 600 after his engine failed. The next week, in the Heluva Good! Sour Cream Dips 400, Johnson spun off turn two, flattening multiple tires, and breaking the sway bar which prompted him to a finish of 27th. During the Toyota/Save Mart 350, Johnson finished seventh after starting 12th on the grid. The finish moved Johnson to third in the Drivers' standings. After returning to Daytona International Speedway for the Coke Zero 400, Johnson and Earnhardt, Jr. ran together for most of the race, like at Talladega, until Johnson pitted under a caution flag. Johnson fell down the grid and was involved in a last lap accident, prompting him to finish 20th. During the next two races, Johnson finished third and fifth in the Quaker State 400 and the Lenox Industrial Tools 301. Two weeks later, Johnson found himself finishing 19th during the Brickyard 400 after coming to pit road with 30 laps remaining in the event. Johnson finished fourth in the Good Sam RV Insurance 500, after bumping Kurt Busch on the final lap. In the next race, Johnson finished tenth. Johnson finished in the top-five in the following three races. During the last race of the regular season, the Wonderful Pistachios 400, Johnson finished in the 31st position. While at Chicagoland Speedway for the GEICO 400, Johnson finished 10th. Afterward, Johnson finished 18th in the Sylvania 300, then second in the AAA 400. One week later, Johnson recorded his second victory of the season in the Hollywood Casino 400. During the Bank of America 500, Johnson was involved in a crash and finished 34th. In the following race, Johnson finished second. For the next two races, Johnson finished 14th in each, and finished 32nd in the Ford 400 to finish sixth in the Driver's championship standings. The third NASCAR Championship for Tony Stewart marked the first time since 2005 that someone other than Johnson was the champion. Johnson began the 2012 season with a 14th-place finish in the Budweiser Shootout after crashing on lap 74. During the Daytona 500, Johnson was involved in a crash on lap 2 when he turned into the wall after contact from Elliott Sadler, then was t-boned by David Ragan, also collecting Danica Patrick, Kurt Busch and Trevor Bayne. Damage to the car was severe, prompting him to retire and finish 42nd. Afterward, he finished fourth and second in the Subway Fresh Fit 500 and Kobalt Tools 400. While at Bristol Motor Speedway for the Food City 500, Johnson finished in the ninth position, moving him up to 11th in the Drivers' Standings. Next, Johnson finished tenth in the Auto Club 400, despite having an oil leak, but the rain saved Johnson from a low finish. He went on to finish twelfth during the spring event at Martinsville after being involved in a crash on the first green-white-checker attempt. In the following event, the Samsung Mobile 500, Johnson finished second after leading much of the race before he was passed by Greg Biffle. Afterward, he recorded a third-place finish in the STP 400 at Kansas on April 22, 2012, and a sixth-place finish in the Capital City 400 at Richmond one week later. On May 6, 2012, Johnson started 19th in the Aaron's 499 at Talladega, but finished 35th after his engine failed on lap 110. Johnson won his first race of the season one week later in the Bojangles' Southern 500 at Darlington. The win was also Rick Hendrick's 200th NASCAR Cup Series win. A week later, he matched Gordon and Dale Earnhardt with three wins in the NASCAR Sprint All-Star Race after winning the 2012 NASCAR Sprint All-Star Race. Next, in the Coca-Cola 600, Johnson finished 11th in the race after a penalty on lap 354. After the Coca-Cola 600, Johnson went on to win his second race of the season in the FedEx 400. In the Pocono 400, he recorded a fourth-place finish after starting 24th on the grid. During the next two races, Johnson placed fifth, moving him to fourth in the standings. Afterward, Johnson finished sixth after winning his first pole position of the season in the Quaker State 400. However, in the Coke Zero 400, Johnson finished 36th after retiring from a crash on lap 124. After finishing seventh during the Lenox Industrial Tools 301, Johnson recorded his third victory of the season and his fourth career win at the Indianapolis Motor Speedway, tying Jeff Gordon for what was the record for the most wins in the Brickyard 400. After making the NASCAR Chase for the Championship, Johnson secured three straight top five finishes in the GEICO 400, Sylvania 300 and AAA 400. Following a seventeenth-place finish in Good Sam Roadside Assistance 500, Johnson recorded four top-ten finishes, including two consecutive wins from the pole position at Martinsville and Texas, which was his sixtieth win in the series, to take a seven-point lead over Brad Keselowski. At Phoenix, Johnson blew a right front tire, which caused him to collide into the wall and finish in the 32nd position. He was racing for the win and the championship the following week at Homestead, but his chances of winning the championship was over after he had a pit road penalty and had a gear failure and he finished 36th in that race, and finished third in the Drivers Championship behind Keselowski and Bowyer. In 2013, Johnson began his season with a 14th-place finish in the 2013 Sprint Unlimited when he crashed on lap 14 along with Kyle Busch, Kurt Busch, Mark Martin, Jeff Gordon, and Denny Hamlin. Afterward, he placed fourth in the first Budweiser Duel, resulting in a ninth-place starting position in the 2013 Daytona 500. In the Daytona 500, Johnson started well, assuming the lead from Jeff Gordon on lap 32 and leading a handful of laps before falling back to the middle of the pack. Over the last few laps, Johnson was racing alongside Brad Keselowski for the lead until a caution came out for debris. Johnson took the advantage of leading on the last restart. With five laps to go, Johnson led a lane with Greg Biffle and Danica Patrick. He then held off a last lap charge from Dale Earnhardt, Jr. and Mark Martin to win his second Daytona 500. This was Johnson's first Daytona 500 win with regular crew chief Chad Knaus, as he won the 2006 race with Darian Grubb as Knaus was serving a five-race suspension. It was also the first time since his 2006 win that he finished better than 27th in the Daytona 500, after a streak of six years where he had never finished better than 27th because of crashes and mechanical failures. The following week at Phoenix, Johnson started inside the top ten and finished second behind Carl Edwards. He followed this with a sixth-place finish at Las Vegas. At Bristol, he was running on the lead lap until a spin late race forced him back to a 22nd-place finish. At Fontana, he struggled for most of the race, racing near the back of the pack, but salvaged a 12th-place finish. Johnson won his first pole position of the season at Martinsville and had the dominant car, leading 346 of 500 laps on the way to his eighth Martinsville race win. Johnson also assumed the point lead as well, which he would hold on to for the remainder of the regular season. Johnson's consistency was enough that there were points in the summer where he was more than a full two race wins' worth of points ahead of Carl Edwards or Clint Bowyer. Afterward, Johnson finished sixth at Texas. At Kansas, he led nine laps and finished third behind Matt Kenseth and Kasey Kahne. Johnson finished 12th the following week at Richmond, allowing him to build even further on his point lead. At Talladega, he was the only driver besides Matt Kenseth to lead double digit laps (16), and finished in fifth place. A fourth-place finish the following week at Darlington allowed Johnson to further solidify his point lead over Edwards. In the 2013 NASCAR Sprint All-Star Race, Johnson won his record fourth All-Star race after a fast pit stop allowed him to start the final 10-lap sprint in second, and later passed Kasey Kahne for the victory. One week later, Johnson finished 22nd after spinning sideways late in the race. At Dover, Johnson led 143 laps, but finished 17th when he jumped Juan Pablo Montoya on the last restart causing NASCAR to issue him a penalty. He was able to redeem himself for this mistake the following week at Pocono by earning the pole position, leading the most laps, and winning his third race of the season, which increased his point lead to 51 points over Edwards. This also snapped a nine-year winless streak for Johnson at Pocono since sweeping both of the track's 2004 NASCAR Cup Series races. At the Quicken Loans 400 at Michigan, Johnson closed in on Greg Biffle for the lead with less than ten laps left, but suffered a flat tire with less than five laps to go. Johnson would finish the race in 28th, his worst finish of the season to that point. Johnson then finished ninth at Sonoma. At Kentucky, Johnson started third. He had the dominant car of the race, leading 182 of 267 laps. However, on a restart on lap 246, Johnson was slow to get up to speed and was subsequently touched and spun by Joey Logano, costing Johnson a shot at the win and giving the race to Matt Kenseth. Johnson was able to charge through the field after the caution and restart to salvage a ninth-place finish. Returning to Daytona for the Coke Zero 400, Johnson led 94 laps and held off Tony Stewart and Kevin Harvick on a green-white-checker finish to win his fourth race of the year. In winning the race, Johnson became the first driver since Bobby Allison in 1982 to sweep both Daytona races in a season. This was a significant improvement in Johnson's runs on the restrictor plate tracks, as he had been crashed out of the running at both Daytona races in 2012, had an engine failure early while leading at Talladega in the spring and was part of a crash on the last lap in the fall. Also, he was one of only three drivers to sweep the top ten, the other two drivers being Ryan Newman and Dale Earnhardt, Jr.
At New Hampshire for the Camping World RV Sales 301, Johnson qualified second, but failed post-qualifying inspection after his car was found to be too low, and started the race in 43rd, the first time in his career he started dead last. In the race, Johnson passed seven cars in the first four laps and reached the Top 20 by lap 50, while reaching the top ten by lap 165; Johnson would finish sixth. He almost won the pole position at Indianapolis but was bumped to second by Ryan Newman. Johnson led the most laps and almost won, but a slow final pit stop cost him the race to Newman. The following week at Pocono, Johnson won another pole position, setting another track qualifying record. He led 43 of the first 80 laps before he cut a right front tire that knocked a spark plug loose and affected the handling of the car. Johnson's pit crew worked hard to repair the car, fixing the plug on the last pit stop, and managing to salvage a 13th-place finish after racing near the back of the pack for most of the race. Returning to Michigan, Johnson qualified third but crashed in happy hour, forcing him to a backup car and a 43rd starting spot. After running up to the lead through pit stop strategy, Johnson lost an engine on lap 55, relegating him to a 40th-place finish. This was followed by a streak of three poor finishes of 36th at Bristol, 28th at Atlanta, and 40th at Richmond due to crashes and mechanical failures. Johnson started the Chase seeded in second place. He started the Chase with a fifth-place finish at Chicago, followed by a fourth-place finish at New Hampshire. At Dover, Johnson led 243 laps and held off Dale Earnhardt, Jr. over the last 25 laps to win his eighth race at the track, also redeeming himself for the restart line violation that had cost him a shot at winning the June race. Johnson spent the next several races chasing Matt Kenseth for the points lead, eventually gaining it at Talladega, though losing it when he and Kenseth tied for points lead at Martinsville. Returning to Texas, Johnson had the dominant car, leading 255 laps to his sixth win of the season. The following weekend at Phoenix, Johnson avoided trouble in tight racing on two separate occasions (a near scrape in turn 4 on the first lap, and later a near spin after contact with Carl Edwards in turn 1) to escape with a third-place finish. He also capitalized on Kenseth suffering from a poor-handling car. With Kenseth finishing 23rd, Johnson took a 28-point lead to the season finale at Homestead-Miami Speedway. In the finale, Johnson raced conservatively to a ninth-place finish to secure his sixth title. He closed out the season with six wins, three poles, 16 top five and 24 top ten finishes, with an average finish of 9.8 and average start of 10.7. Statistically, 2014 was Johnson's second worst season to date. He started the season on an up-and-down note, but went winless through the first 11 races of the 2014 season (his best finish was 2nd at Martinsville). Skepticism began to arise, as he had never gone more than 12 races into a season without a win, and hadn't gone that long since the first few years of his Cup career. However, Johnson won the Coca-Cola 600, his first win in the race since 2005. Afterward, he went on to win at Dover the following week, making it the 13th time he had back-to-back wins. A few weeks later, Johnson recorded his first win at Michigan, after several years of being deprived of a shot at victory as the result of running out of gas or blowing an engine. However, he didn't keep up with the momentum. After finishing in the top ten at Sonoma and Kentucky, Johnson was collected in an early wreck in the Coke Zero 400, finishing 42nd. Johnson's streak of misfortune continued the next several weeks, finishing 42nd for the second week in a row at New Hampshire. This was followed up by an inconsistent run at Indy (14th), and poor showings resulting from accidents at Pocono (39th) and Watkins Glen (28th). Despite the poor finishes, Johnson qualified fourth for the Chase. In the Chase, Johnson finished 12th at Chicagoland, fifth at New Hampshire, and third at Dover to advance to the Contender Round. However, trouble struck when he finished 40th and 17th in the next two races. At Talladega, Johnson started second and he led a high of 84 laps. However, a 24th-place finish kept him from advancing to the Eliminator Round. At Martinsville, Johnson started seventh but finished 39th after being involved in a crash early in the race. Returning to Texas, Johnson dominated and held off Brad Keselowski and Kevin Harvick to score his third straight win in the fall Texas race, and also ended an 18-race-winless-streak. At Phoenix, he struggled for most of the day and finished 38th after blowing a tire and crashing out. At the season finale at Homestead, Johnson finished ninth, and closed out finishing 11th in points. This marks the first time in Johnson's NASCAR Cup career that he has finished outside of the top ten in the final points. Johnson leading the 2015 Daytona 500. Johnson began his season with a win in the Budweiser Duel. He started the season by finishing fifth in the Daytona 500 for the second year in a row. The following week, he won the Folds of Honor QuikTrip 500 at Atlanta. At Las Vegas, Johnson crashed twice into the outside wall, leaving him with a 41st-place finish. He rebounded with an 11th-place finish in Phoenix and a ninth-place finish at California, his first top ten there in two years. At Martinsville, he struggled to a 35th-place finish. However, his momentum returned at Texas when he held off Kevin Harvick and Dale Earnhardt, Jr. to win. At Bristol, he avoided tight trouble early in the race and came home second to polesitter Matt Kenseth. At Richmond, he finished third. These finishes moved him back up to fourth in the standings. At Talladega, Johnson started fifth and led 50 laps, only to finish second to Earnhardt, Jr.
At Kansas, Johnson gambled by staying out on the last round of pit stops, and held off Harvick and Earnhardt again to win his third race at Kansas and of the season. In winning, he established a Cup record of 23 wins on 1.5-mile tracks, taking what was both his 200th top five and his 300th top ten finish. At Charlotte, he spun out on two occasions. The first time was early in the race while running 16th coming out of turn 4 but he was lucky to avoid hitting anything. He wasn't so lucky on the second spin late in the race; while running fifth, he spun out again at exactly the same place, and hit the wall in pit road, causing some nose damage. Those spin-outs would leave him with a 40th-place finish. He rebounded the following week with a win at Dover, and also became one of four drivers to have won 10 or more races at one track. This gave him a total of 74 career wins, two fewer than Dale Earnhardt's 76. At Pocono, Johnson cut a tire on lap 88, but did not take major damage. He was able to work his way through the field to finish in third place. He finished 19th at Michigan after the race was called for rain on lap 138. At Sonoma, Johnson led the most laps at 45 laps, but a late race caution caused by Casey Mears' broken wheel axle cost him, and he was passed by Kyle Busch with five laps to go, and slipped back to sixth place. Returning to Daytona, Johnson started 12th and led 35 laps before finishing second to Dale Earnhardt, Jr., in a repeat of the Talladega race. At Kentucky, Johnson started sixth and ran inside the top ten for most of the night, finishing ninth. At the second stop in Pocono, Johnson, along with two of his Hendrick teammates, Jeff Gordon, and Dale Earnhardt, Jr, took advantage of several cars running out of fuel to finish in the Top 6 (Gordon finished 3rd, Dale Jr. took 4th, Johnson grabbed 6th). At Watkins Glen, despite suffering two penalties (lap 3: Overshooting the entrance to the inner loop, and caution No. 1 (lap 26-28): Speeding through pit road) Johnson rallied to finish 10th. He wasn't so lucky at Michigan, late in the race, he got loose and spun in turn 3, and damaged the splitter on his car, resulting in a 39th-place finish (10 laps down). He rebounded at Bristol by finishing 4th, but had bad luck once more at Darlington. He spun out on lap 134 in turn 4, bringing out the 7th caution, and was never a real threat. He ended up 19th. He was able to recover a bit for a 9th-place finish at Richmond, and started 1st in the Chase in a three-way-tie between him, Kyle Busch, and Matt Kenseth. Johnson opened up the Chase in a rough way. At Chicagoland, he blew a left front tire early in the race, but was able to charge through the field to salvage an 11th-place finish. He also was the subject of controversy when he made contact with Kevin Harvick on a three-wide pass that led to Harvick cutting a left rear tire, leaving Harvick with a 42nd-place finish. At Loudon, Johnson finished 6th after blowing a tire in the 3rd position. At Dover, his Chase hopes came to an end when his car broke a drive line, leading him to finish 36 laps down in 41st place. At the fall race at Texas Johnson won, passing Brad Keselowski with 4 laps to go. This marked his fourth consecutive win in the fall race, and third consecutive win on that track, having also won the spring race. That victory also marked the 75th of his NASCAR Cup Series career, putting him one race win short of tying Dale Earnhardt's career wins. Also in the process, he snapped a 20-race-winless-streak. Johnson finished 5th at Phoenix, and for the third year in a row, he finished 9th at Homestead. Also in the process, he edged out Ryan Newman by 1 point to finish 10th in the final standings. With the retirement of his teammate and mentor, Jeff Gordon, Johnson assumed the active wins record with 75. Johnson began the 2016 season with a 16th-place finish at the Daytona 500. In the next race at Atlanta Motor Speedway, he won his 1st race of the season and the 76th of his career, tying Dale Earnhardt for seventh on the all-time wins list. Johnson finished third and eleventh in the next two events of the season at Las Vegas and Phoenix. His second victory of the season came in the fifth race, the Auto Club 400, where Johnson passed Harvick in an overtime finish. It was also the first time since 2011 that he finished in the top five at the Auto Club Speedway. In the STP 500 at Martinsville Speedway, Johnson recorded a 9th-place finish after moving through the field after qualifying 24th. One week later, Johnson finished fourth in the Duck Commander 500 at Texas Motor Speedway despite suffering minor damage during a 13-car accident that occurred within 50 laps of the finish. In the Food City 500 at Bristol, Johnson finished 23rd after making an unscheduled pit stop due to a loose lug nut on lap 300. At Richmond, he led 44 laps early in the race and finished 3rd. At Talladega, Johnson was spun by Paul Menard and got involved in a multi-car accident with 28 laps to go, finishing 22nd. Johnson's streak of misfortune continued through the next several months, crashing out at Dover, Pocono, Daytona, Kentucky and at Watkins Glen, where he finished last for the first time in his career. His top-10 finishes during the period came only in the Coca-Cola 600 and Brickyard 400, where he finished 3rd in both races. Johnson finished 7th and 6th at Bristol and Michigan the following two weeks, but finished 33rd at Darlington after he spun out of turn 4. Johnson then finished 11th at Richmond. He qualified 8th for the Chase. Johnson began the Chase for the Championship by leading a race-high 118 laps at Chicagoland, but received a speeding penalty during a green flag pit stop late in the race, ultimately finished 12th. Johnson finished 8th the following week at Loudon. At Dover, Johnson led 90 laps but once again received a pit road penalty with 105 laps to go, costing him a win. He would charge through the field and finish 7th (1st car a lap down). He was able to move to the "Round of 12" of the Chase. At Charlotte, Johnson led a race-high 155 laps and won the Bank of America 500, claiming his 8th win at the track and the 3rd win of the season, also snapping his 24-race winless streak. This marked Johnson's first appearance in the "Round of 8" under the current Chase system. He then finished 4th at Kansas and 23rd at Talladega. At Martinsville, Johnson had contact with Denny Hamlin on lap 198 and had a tire rub to cause a caution but was able to stay on the lead lap. Later during a caution on lap 362, he lost fuel pressure but was able to get the car refired and stayed on the lead lap again. After the restart, he took the lead from Hamlin and led the final 92 laps to win the Goody's Fast Relief 500. This locked him into the Championship 4 for the final race at Homestead. Johnson finished 11th in the rain-shortened race at Texas, and 38th at Phoenix after being penalized a lap for passing the pace car coming down to pit road and involved in a wreck on a restart. Johnson claimed his seventh championship by winning at Homestead on November 20. After losing his starting spot due to a pre-race inspection fault, Johnson started at the rear of the field. He progressed though the field, cracking the top 10 quickly, but remained stagnant around 5th place for a majority of the race. On a restart with 10 laps to go, Carl Edwards came across the nose of Joey Logano, hit the inside wall and triggered a massive wreck, ending Edwards' championship hopes. Johnson avoided the accident, and was put into position to win the title. On the final restart, he passed Kyle Larson, winning the race and his seventh championship, tying Richard Petty and Dale Earnhardt for the most all-time of championships. Johnson came into 2017 as the defending Monster Energy NASCAR Cup Series champion. The start of the season didn't go as smoothly as the end of last season, however. Through the first six races of the season, Johnson only scored one top ten finish. He rebounded with back to back wins at the 2017 O'Reilly Auto Parts 500 in Texas and the 2017 Food City 500 at Bristol. This would be the 14th time he has won back-to-back races in his career. Johnson then finished just outside the top ten at Richmond, even after colliding with his teammate Dale Earnhardt Jr earlier in the race. Johnson scored his third win of the season at Dover in June after beating Kyle Larson in an overtime finish. This was Johnson's 11th win at Dover and 83rd career win, which tied him with Cale Yarborough. The rest of the season didn't go smoothly for Johnson. On June 11, 2017, during the Axalta presents the Pocono 400, Johnson's brakes failed causing him and Jamie McMurray to crash hard, causing McMurray's car to burst into flames. Johnson was uninjured in the accident. Johnson suffered a big slump during the summer part of the season, only getting 3 Top 10 finishes, no Top 5 finishes, and 3 DNF's from Kentucky, Indianapolis, and Pocono. Regardless, Johnson was able to make the playoffs from the earlier wins. Johnson was one of the favorites to win the title after making through the first round with an 8th-place finish at Chicago, a 14th-place finish at New Hampshire, and a 3rd-place finish, at Dover. In the second round, Johnson finished with a 7th-place finish at Charlotte, but the next week he was involved in The Big One at Talladega finishing 24th after his car was disqualified for violating the NASCAR Damaged Vehicle Policy in which his crew worked on the car during the red flag. At Kansas in the elimination race, Johnson was entering as the spot to advance with a 7-point advantage but advanced after finishing 6th and getting 5 points in Stage 1 and staying out before the end of Stage 2 and finishing 10th, getting 1 stage point, and even though he spun a few times, he got by a big wreck involving Chase Drivers Matt Kenseth and Jamie McMurray and finished the race in 11th place, advancing to the Round of 8. Unfortunately his performance slipped in the third round. He finished 12th at Martinsville, but had tire problems at Texas which slipped him to finish 27th and had a chance to win at Phoenix but blew a tire just one lap before the end of Stage 2 which put him in the garage and ended his day and he was eliminated in the round of 8. Johnson would go on to finish 10th in the final standings. Johnson's Speedweeks did not go smoothly, wrecking in each of his three races. At the Advance Auto Parts Clash, he was wrecked on the last lap by Kyle Larson; this was the seventh year in a row he failed to finish the Clash. Johnson qualified third for the 2018 Daytona 500, but had to go to a backup car after wrecking in his Duel. On lap 59 of the Daytona 500, he got caught up in a wreck started by Ryan Blaney, and Ricky Stenhouse Jr., which also involved his teammate William Byron, Erik Jones, Daniel Suárez, Trevor Bayne, and Ty Dillon and ended up 38th. Since then, Johnson struggled throughout the 2018 season with only two top-fives and eight top-10 finishes by the time he barely made the Playoffs for the 15th season in a row. Johnson's only great run off the season came at the Charlotte Roval race where he ran in the Top 10 for most of the day and battled Martin Truex Jr. for the win on the final lap, but he locked his brakes on turn 17 and spun out of control, taking Truex out with him in the process while Blaney passed them to win the race. Johnson finished eighth, and as a result of a three-way tie with 0 points, he was eliminated in the Round of 16. Johnson would go on to score only one more top-ten finish afterwards and wound up a career-worst 14th in the final point standings, winless for the first time in his illustrious career along with equaling his career-low 11 top-ten finishes for the second season in a row. On March 14, 2018, Lowe's announced they would no longer sponsor the 48 car at the conclusion of the 2018 season. In October, it was announced that Johnson and his long time crew chief Chad Knaus would part ways at the end of the season, ending a 17-year partnership, the longest in NASCAR history. Johnson will be paired with JR Motorsports crew chief Kevin Meendering in the 2019 season. On October 28, 2018, Hendrick Motorsports announced that Ally Financial signed a two-year deal to sponsor the No. 48 team starting in 2019. On November 26, 2018, Johnson participated in a motorsports cultural exchange with two-time Formula One champion Fernando Alonso at Bahrain International Circuit, where both drivers compared their respective race cars. The 2019 season started on a positive note for Johnson, as he won the 2019 Advance Auto Parts Clash after contact between him and Paul Menard sent Menard spinning while battling for the lead and triggering "The Big One" on lap 55 right before the rain arrived. It was also the first race with new sponsor Ally Financial and crew chief Kevin Meendering. He followed it up by finishing 8th in the first duel race. In the Daytona 500, Johnson ran up front most of the race, but when he came to pit road with around 40 to go, a car spun behind him and hit him in the left rear. The contact ripped off the left rear quarter-panel. He recovered to finish 9th after being 2 laps down. The next race at Atlanta Motor Speedway, Jimmie finished 24th, 2 laps down. He followed up by finishing 19th. He followed up that performance with a 9th place finish. On March 29 in O'Reilly Auto Parts 500 qualifying at Texas, Johnson got his first pole since 2016 at Texas and scored his first top-five finish since the 2018 Coca-Cola 600 two days later. Johnson driving a Fiat Grande Punto S2000 Abarth at the 2007 Race of Champions at Wembley Stadium. Johnson first raced in the Race of Champions in Europe in 2002. He was eliminated in the first runoff by then world rally champion Marcus Grönholm of Finland but he and Jeff Gordon and Colin Edwards racing as Team USA won the teams' championship. He returned to the event two years later but lost the quarter finals 0–2 to Mattias Ekström of Sweden who was DTM German Touring Car champion that year. Johnson entered the 2006 event but did not start due to injury received just days before the race. He still attended the event to cheer for teammate Travis Pastrana. In the 2007 event Johnson was eliminated before the quarter-finals by F1 driver Sébastien Bourdais of France. In 2004, he began his Grand-Am career in the Rolex 24 at Daytona, where he finished eighth. He also entered the event one year later, which his team, Howard-Boss Motorsports, finished second. Two years later, he entered two events, which were both held at Daytona International Speedway. During the races, his team finished 9th and 19th. In 2008, Johnson moved to Bob Stallings Racing with Alex Gurney and Jon Fogarty to race in the 2008 Rolex 24 at Daytona, where the team finished second. One year later, he returned with GAINSCO/Bob Stallings Racing for his fifth Rolex 24 appearance. During the race, his team finished seventh. He returned to the team in 2010, to race in the Rolex 24 and Sahlen's Six Hours of the Glen. During the Rolex 24 at Daytona his team finished 21st, while at Watkins Glen the team finished sixth. He returned to the Rolex 24, in 2011 where his team finished 15th. Johnson was born on September 17, 1975 in El Cajon, California, the son of Catherine Ellen "Cathy" (née Dunnill) and Gary Ernest Johnson. He has two younger brothers, Jarit and Jessie. Both have made professional off-road racing starts in the TORC: The Off-Road Championship. Johnson attended Granite Hills High School, while he raced motorcycles during the weekends. He was a varsity water polo player, diver, and swimmer, and graduated in 1993. The number 48 is retired from all sports teams uniforms at his school and Johnson was inducted into the school's Athletic Hall of Fame. Johnson lives in Charlotte, North Carolina like many other NASCAR drivers. He is married to Chandra Janway, the two having known each other since 2002. They have two daughters, Genevieve and Lydia. Johnson is a triathlete, regularly participating in triathlons and long-distance running; the Jimmie Johnson Foundation's Wellness Challenge also hosts triathlons. In 2019, he competed in the Boston Marathon, finishing with a time of 3:09:07 and 4,155th overall (3,746th among males and 641st in the Male 40–44 class). The Jimmie Johnson Foundation was launched by Johnson and his wife, Chandra, in 2006. The foundation helps children, families, and communities in need. In 2007, Johnson opened Jimmie Johnson's Victory Lanes in Randleman, North Carolina, which is a four-lane bowling alley for campers at Pattie and Kyle Petty's Victory Junction Gang Camp. The foundation supports several charities, including Habitat for Humanity, Hendrick Marrow Program, Make-A-Wish Foundation, and Victory Junction. Every year, it holds a golf tournament in San Diego, which raises money for K-12 public education. Since the beginning, the tournament has raised a total of $8 million to help fund several projects. During 2009 and 2010, the foundation awarded $1.5 million for the Education Champions Grants program. The money is given to public schools in California, Oklahoma, and North Carolina. It helps fund basic needs, such as technology, outdoor classrooms, playground construction, and reading programs. The foundation has also assisted the American Red Cross with disaster relief efforts. In 2014, Johnson joined the Ban Bossy campaign, as a spokesperson advocating leadership in young girls. In 2000, People recognized Johnson as one of their "Men in the Fast Lane." Johnson has won the Driver of the Year Award five times (2006, 2007, 2009, 2010, 2013). In 2009, he became the first racing driver to win the Associated Press Male Athlete of the Year Award in the United States. Johnson was ranked No. 1 on Forbes.com's list of "Most Influential Athletes" for two consecutive years (2011, 2012). In 2018, Johnson received the fourth-annual Byrnsie Award, named after the late Fox NASCAR broadcaster Steve Byrnes, during FS1's RaceDay prior to the running of the Toyota/Save Mart 350 at Sonoma Raceway. With 83 career points-paying victories, Johnson is the winningest active driver, sixth place among the all-time NASCAR Cup Series winners; he is also ranked third among those who have competed during the sport's modern era (1972–present). Johnson has won a Cup Series race at every track on the schedule except at Chicagoland Speedway, Kentucky Speedway, and Watkins Glen International. Johnson is the only driver to have qualified for the NASCAR Cup Series playoffs every single year since its inception in 2004. He also holds the record for the most consecutive and total playoffs appearances, with 15. Johnson made an appearance as himself in the 2005 film Herbie: Fully Loaded, commenting on Herbie's sunroof as unusual for a stock car to have, and his car is also briefly seen from Herbie's POV. Johnson starred in an episode of the television series Las Vegas in 2005. Johnson starred in an episode of the HBO reality television series 24/7, titled "Jimmie Johnson: Race to Daytona". Cameras followed him from January 2010 to the 52nd Daytona 500 held on February 14. Johnson appeared on The Ellen DeGeneres Show during its tenth season in 2013. Fresh off his second Daytona 500 victory, Johnson challenged host Ellen DeGeneres to a go-kart race. On November 19, 2013, Johnson became the first professional athlete to co-host ESPN's flagship news show, SportsCenter. In 2015, Johnson appeared on the series Repeat After Me and voiced a lobster named Jimmie on the animated kids show Bubble Guppies. Johnson has appeared on the cover of several magazines, including NASCAR Illustrated; Sports Illustrated; Men's Fitness; and Success. Johnson makes a cameo appearance as a pilot in the music video for The Avett Brothers' "Ain't No Man," the lead single from the album True Sadness (2016). Johnson's Cup ride, the No. 48 Lowe's Chevrolet, is featured on the covers of NASCAR Racing 2003 Season and NASCAR The Game: 2011. Johnson and Hendrick Motorsports teammate Jeff Gordon are featured on the cover of NASCAR 06: Total Team Control, highlighting Team Control, the main addition of the game. Johnson is also one of the six cover drivers of NASCAR Kart Racing. Johnson is featured in the 2011 racing video game Jimmie Johnson's Anything with an Engine. Johnson is featured as a playable driver in Forza Motorsport 6, via the NASCAR expansion pack. The expansion features twenty-four paint schemes from the 2016 Sprint Cup Series season, including Johnson's No. 48 Lowe's SS. Johnson, along with Chase Elliott and Kyle Busch, provide commentary in the expansion as the "voices of motorsport." Johnson and Elliott also had roles in developing the expansion. ^ a b c d e "Official Site of Hendrick Motorsports NASCAR Racing & Team Store". Hendrickmotorsports.com. September 17, 1975. Retrieved February 6, 2011. ^ a b "CORR: Scott Taylor wins Governor's Cup at Crandon". Motorsport.com. Retrieved January 12, 2013. ^ "FANS CHEER LAKE GENEVA SODA SEASON OPENER". Retrieved July 27, 2013. ^ "Antigo 1997". Off-road.com. Retrieved July 27, 2013. ^ "Douglas Scores Double Win at Lake Geneva Race". Off-road.com. Retrieved July 27, 2013. ^ "Class 8 points standings". Off-road.com. Retrieved July 27, 2013. ^ a b c d e f "Jimmie JohnsonBiography, Pictures, Videos, & Quotes". Jimmie Johnson .org. Archived from the original on July 26, 2011. Retrieved February 6, 2011. ^ a b Jim, Tretow. "Howie Lettow Remembered". Speed 51. Archived from the original on July 16, 2011. Retrieved August 21, 2010. ^ a b c d e f g h i j "Team Lowe's Racing – Jimmie Johnson". Lowesracing.com. September 17, 1975. Archived from the original on December 17, 2010. Retrieved February 6, 2011. ^ "NASCAR.COM – Before Hendrick, there was Herzog Motorsports". December 7, 2006. Nascar.com. Archived from the original on October 10, 2012. Retrieved February 6, 2011. ^ Caraviello, David (January 20, 2014). "TOP TEN ROOKIE CAMPAIGNS AT NASCAR'S HIGHEST LEVEL". NASCAR. Retrieved January 20, 2014. ^ "2003 Standings". NASCAR.com. Archived from the original on October 12, 2012. Retrieved November 22, 2010. ^ "Johnson's First Martinsville Win Came With a Price". Bleacher Report. March 23, 2010. Retrieved February 6, 2011. ^ "2004 Jimmie Johnson Season Stats | Racing Season Stats and Results | NASCAR Sprint Cup | FOX Sports on MSN". Msn.foxsports.com. Archived from the original on April 19, 2010. Retrieved February 6, 2011. ^ "2005 Jimmie Johnson Season Stats | Racing Season Stats and Results | NASCAR Sprint Cup | FOX Sports on MSN". Msn.foxsports.com. Archived from the original on April 19, 2010. Retrieved February 6, 2011. ^ "2006 Jimmie Johnson Season Stats | Racing Season Stats and Results | NASCAR Sprint Cup | FOX Sports on MSN". Msn.foxsports.com. Archived from the original on April 19, 2010. Retrieved February 6, 2011. ^ "2007 Jimmie Johnson Season Stats | Racing Season Stats and Results | NASCAR Sprint Cup | FOX Sports on MSN". Msn.foxsports.com. Archived from the original on April 19, 2010. Retrieved February 6, 2011. ^ Marty Smith (February 13, 2010). "JJ strengthens his grip on Cup reign". ESPN.com. Retrieved March 5, 2012. ^ David Caraviello (October 23, 2010). "For some, running means a different kind of race". NASCAR.com. Archived from the original on October 19, 2011. Retrieved March 5, 2012. ^ "John Sitaras and Jimmie Johnsonon ESPN". ESPN.com. Retrieved March 5, 2012. ^ David Caraviello (July 18, 2011). "Setting the golden standard". NASCAR.com. Archived from the original on October 19, 2011. Retrieved March 5, 2012. ^ Fryer, Jenna (December 21, 2009). "NASCAR's Johnson wins male athlete of the year". Boston Globe. Retrieved February 6, 2011. ^ "2008 Jimmie Johnson Season Stats | Racing Season Stats and Results | NASCAR Sprint Cup | FOX Sports on MSN". Msn.foxsports.com. Archived from the original on April 19, 2010. Retrieved February 6, 2011. ^ "NASCAR's Jimmie Johnson wins Driver of the Year". USA Today. December 15, 2010. Retrieved February 6, 2011. ^ "Johnson captures 5th straight NASCAR title – Motor sports- NBC Sports". Nbcsports.msnbc.com. November 21, 2010. Retrieved February 6, 2011. ^ "Johnson wins fifth straight title; Edwards wins race". Sporting News. November 21, 2010. Archived from the original on November 23, 2010. Retrieved November 28, 2009. ^ "Johnson wins Prelude to the Dream at Eldora". Autoweek.com. Retrieved November 22, 2010. ^ a b c d e f g h i j k l "Jimmie Johnson – 2011 NASCAR Sprint Cup Series Results". Racing-Reference. USA Today Sports Media Group. Retrieved October 26, 2014. ^ "Bayne becomes youngest Daytona 500 winner". Sporting News Wire Service. NASCAR.com. February 11, 2011. Retrieved June 20, 2013. ^ "Johnson nips Bowyer at the line, wins at Talladega". Sporting New Wire Service. NASCAR.com. Retrieved June 5, 2011. ^ Aumann, Mark (June 20, 2011). "Spins, scrapes and struggles ... Oh my!". NASCAR.com. Retrieved June 20, 2013. ^ "Gordon, Johnson finish in top ten at Sonoma". Hendrick Motorsports. June 26, 2011. Retrieved August 8, 2011. ^ "Earnhardt, Johnson: no hard feelings after Daytona". ESPN. July 8, 2011. Retrieved August 8, 2011. ^ "Gordon finishes second, teammates in top 19 at Indianapolis Motor Speedway". Hendrick Motorsports. July 31, 2011. Retrieved August 8, 2011. ^ "Busch stands his ground and grabs third at Pocono". NASCAR.com. August 8, 2011. Retrieved August 8, 2011. ^ "Johnson Finishes 14th in Shootout". Press Release. Catchfence.com. February 19, 2012. Archived from the original on March 4, 2016. Retrieved February 27, 2012. ^ "Jimmie Johnson, Danica Patrick crash". Associated Press. ESPN. February 28, 2012. Retrieved March 18, 2012. ^ a b c d e f g h "Jimmie Johnson – 2012 NASCAR Sprint Cup Series Results". Racing-Reference. USA Today Sports Media Group. Retrieved October 26, 2014. ^ "2012 Official Driver Standings: Food City 500". NASCAR.com. Archived from the original on September 8, 2012. Retrieved March 21, 2012. ^ "Johnson ninth, Earnhardt 15th at Bristol". Hendrick Motorsports. March 18, 2012. Retrieved March 18, 2012. ^ Pockrass, Bob (March 25, 2012). "Jimmie Johnson gets big break with California rain". Sporting News. Retrieved March 25, 2012. ^ "Newman wins at Martinsville after leaders crash". NASCAR Wire Service. NASCAR.com. April 2, 2012. Retrieved May 11, 2012. ^ Jensen, Tom (April 14, 2012). "CUP: Biffle Makes Late Charge To Victory". Speed TV. Archived from the original on April 17, 2012. Retrieved May 11, 2012. ^ "Lap-by-Lap: Talladega". NASCAR.com. May 6, 2012. Retrieved May 11, 2012. ^ "At long last! Johnson wins 200th for Hendrick". NASCAR Wire Service. NASCAR.com. May 13, 2012. Retrieved May 13, 2012. ^ "Jimmie Johnson wins All-Star race". The Associated Press. ESPN Dallas/Fort Worth. May 20, 2012. Retrieved May 26, 2012. 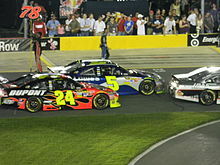 ^ "Kahne wins at Charlotte, teammates in top 11". Hendrick Motorsports. May 27, 2012. Retrieved June 2, 2012. ^ "Johnson wins FedEx 400 at Dover". Associated Press. Msn.foxsports.com. June 4, 2012. Retrieved June 4, 2012. ^ Jensen, Tom (June 10, 2012). "CUP: Johnson Rallies For Fourth". Speed TV. Archived from the original on August 16, 2012. Retrieved July 23, 2012. ^ "Top Five Finish at Sonoma". Team Lowe's Racing. June 24, 2012. Retrieved July 23, 2012. ^ Associated Press (July 2, 2012). "Brad Keselowski wins third of 2012". ESPN. Retrieved July 23, 2012. ^ "Stewart emerges from wild finish for Daytona win". NASCAR.com. July 9, 2012. Retrieved July 23, 2012. ^ Ryan, Nate (July 29, 2012). "Fourth Brickyard win stamps Jimmie Johnson as Chase favorite". USA Today. Retrieved July 29, 2012. ^ "Jimmie Johnson extends Chase lead". ESPN. November 5, 2012. Retrieved January 31, 2013. ^ Long, Dustin (November 12, 2012). "Blown tire all but ends Jimmie Johnson's title hopes". USA Today. Retrieved January 31, 2013. ^ Olsen, Jeff (November 18, 2012). "Gears and lug nuts doom Jimmie Johnson's title hopes". USA Today. Retrieved January 31, 2013. ^ a b c "Jimmie Johnson – 2013 NASCAR Sprint Cup Series Results". Racing-Reference. USA Today Sports Media Group. Retrieved October 26, 2014. ^ Nate Ryan and Heather Tucker (February 24, 2013). "Jimmie Johnson wins Daytona 500; Danica Patrick eighth". USA Today. Retrieved February 24, 2013. ^ Fryer, Jenna (May 18, 2013). "Jimmie Johnson races to record 4th All-Star win". Yahoo! Sports. Archived from the original on June 8, 2013. Retrieved May 18, 2013. ^ Bruce, Kenny (June 16, 2013). "Trouble snares Hendrick quartet at Michigan". NASCAR.com. Retrieved June 16, 2013. ^ Fryer, Jenna (July 6, 2013). "Johnson 1st driver to sweep Daytona since 1982". Yahoo! Sports. Archived from the original on July 10, 2013. Retrieved July 6, 2013. ^ Bruce, Kenny (July 12, 2013). "Johnson's time disallowed, will start at rear". Yahoo! Sports. Retrieved July 14, 2013. ^ Cain, Holly (July 14, 2013). "Jimmie Johnson caps major rally at New Hampshire". NASCAR. Retrieved July 14, 2013. ^ "Jimmie Johnson wins record eighth victory at Dover". Hendrick Motorsports. September 29, 2013. Retrieved September 30, 2013. ^ "Jimmie Johnson wins Coca-Cola 600". ESPN. May 26, 2014. Retrieved June 1, 2014. ^ "Jimmie Johnson makes it nine wins at Dover". USA Today. June 1, 2014. Retrieved June 1, 2014. ^ "Jimmie Johnson falls from No. 2 in NASCAR Cup Series points standings". ^ "Johnson survives for soggy Atlanta win". ^ Bonkowski, Jerry. "Jimmie Johnson leads Hendrick onslaught, holds off Kevin Harvick to win at Kansas". NASCAR Talk. NBC Sports. Retrieved May 10, 2015. ^ Dutton, Monte (February 29, 2016). "Johnson Ties Earnhardt Victory Mark as NASCAR Returns to Normal". Bleacher Report. Retrieved March 25, 2016. ^ "Johnson claims sixth Fontana title in Sprint Cup". ESPN. March 20, 2016. Retrieved March 25, 2016. ^ Caldwell, Gray (April 3, 2016). "Race Recap: Johnson battles for top-10 finish at Martinsville". Hendrick Motorsports. Retrieved July 11, 2016. ^ Spencer, Reid (April 10, 2016). "Kyle Busch extends streak; corrals Texas win". NASCAR.com. NASCAR Media Group, LLC. Retrieved July 11, 2016. ^ "Jimmie Johnson wins rain-shortened Advance Auto Parts Clash". NASCAR.com. NASCAR Digital Media, LLC. February 10, 2019. Retrieved February 11, 2019. ^ "News Story – Nascar champ Johnson and X-games hero Pastrana challenge worlds best at The". Race of Champions. Retrieved February 6, 2011. ^ "News Story – NASCAR champion Jimmie Johnson goes head-to-head with Michael Schumacher at the". Race of Champions. Retrieved February 6, 2011. ^ "Jimmie Johnson". Race of Champions. Retrieved February 6, 2011. ^ JOHN KEKIS, AP Sports Writer. "Johnson takes on Watkins Glen in 6-hour Rolex race". SignOnSanDiego.com. Retrieved February 6, 2011. ^ "Rolex 24 at Daytona Results (2010)". Grand-am.com. Archived from the original on February 4, 2010. Retrieved February 6, 2011. ^ "Sahlen's Six Hours of The Glen Results (2010)". Grand-am.com. Archived from the original on April 2, 2012. Retrieved February 6, 2011. ^ "Rolex 24 at Daytona Results (2011)". Grand-am.com. Archived from the original on February 1, 2012. Retrieved February 6, 2011. ^ "Jimmie Johnson". Grand-am.com. September 17, 1975. Archived from the original on March 2, 2012. Retrieved February 6, 2011. ^ "Bio". Jimmie Johnson official website. Retrieved September 5, 2013. ^ Mcubbin, Ashley (December 4, 2008). "Jimmie Johnson: Just a California Kid". Bleacher Report. Retrieved July 3, 2013. ^ "2015 TORC drivers standings". TORC: The Off-Road Championship. October 31, 2015. Retrieved October 31, 2015. ^ a b "About Us". The Jimmie Johnson Foundation. July 7, 2010. Archived from the original on July 19, 2009. Retrieved February 6, 2011. ^ Ken Stone (December 16, 2010). "Jimmie Johnson Foundation Helping Rev Up Grossmont Performing Arts – La Mesa, CA Patch". Lamesa.patch.com. Archived from the original on January 12, 2012. Retrieved February 6, 2011. ^ "Jimmie Johnson's Road to American Hero". AOL News. November 17, 2009. Archived from the original on October 8, 2012. Retrieved August 26, 2011. ^ "chandra johnson". PlayerWives.com. July 16, 1978. Retrieved February 6, 2011. ^ "Jimmie Johnson's Loyalty Shows with New Baby's Name". Bleacher Report. July 11, 2010. Retrieved November 12, 2010. ^ Estrada, Chris (September 6, 2013). "Jimmie Johnson, wife Chandra welcome baby girl; Regan Smith to fill in today". NBC Sports. Retrieved September 6, 2013. ^ Martinelli, Michelle R. (July 7, 2017). "Jimmie Johnson is obsessed with finishing a 140.6-mile IRONMAN triathlo". USA Today. For The Win. Retrieved April 15, 2019. ^ "Jimmie Johnson finishes first Boston Marathon: 'It's been an amazing experience'". NASCAR. April 15, 2019. Retrieved April 15, 2019. ^ "Annual Golf Tournament". The Jimmie Johnson Foundation. Archived from the original on July 20, 2009. Retrieved February 6, 2011. ^ "Celebrities Join the American Red Cross in 2008. In December 2010, Johnson visited Collinswood Language Academy. He donated $17,000 to build a new playground". The Jimmie Johnson Foundation. February 27, 2008. Archived from the original on September 22, 2010. Retrieved February 6, 2011. ^ Sandberg, Sheryl; Chávez, Anna Maria (March 8, 2014). "Sheryl Sandberg and Anna Maria Chávez on 'Bossy,' the Other B-word". The Wall Street Journal. The Wall Street Journal. Retrieved June 13, 2014. ^ "Men in the Fast Lane". People. November 13, 2000. Retrieved April 1, 2018. ^ "FOX NASCAR bestows 'The Byrnsie Award' on Jimmie Johnson". Jayski's Silly Season Site. June 24, 2018. Retrieved June 24, 2018. ^ "Las Vegas Episode Guide 2006 Season 3 - Urban Legends, Episode 15". TV Guide. Retrieved April 24, 2014. ^ 1 December 2010 24/7. "HBO's 24/7 Jimmie Johnson: Race to Daytona to Debut January 26". Darlington Raceway. Retrieved January 30, 2011. ^ "Ellen Races Jimmie Johnson". July 15, 2013. Archived from the original on December 9, 2014. Retrieved December 5, 2014. ^ Scott, Nate (November 19, 2013). "Jimmie Johnson becomes first athlete co-host for SportsCenter". USA Today. McLean, VA. Retrieved November 19, 2013. ^ "January 2014". NASCAR Illustrated. Archived from the original on February 11, 2016. Retrieved February 9, 2016. ^ "Jimmie Johnson To Be on Cover of Sports Illustrated". SB Nation. November 18, 2008. Retrieved February 9, 2016. ^ "Jimmie Johnson on SI cover". Charlotte, NC: ESPN. October 11, 2011. Retrieved February 9, 2016. ^ "Video! NASCAR Superstar Jimmie Johnson's Workout Secrets". Extra. April 22, 2013. Retrieved February 9, 2016. ^ Caldwell, Gray (February 9, 2016). "Johnson graces 'SUCCESS Magazine' cover". Concord, NC: Hendrick Motorsports. Retrieved February 9, 2016. ^ Hilton, Robin (May 13, 2016). "First Watch: The Avett Brothers, 'Ain't No Man'". NPR Music. Retrieved May 17, 2016. ^ Berardini, César (August 22, 2005). "NASCAR 06: Total Team Control Cover Athletes Announced". TeamXbox. Archived from the original on November 28, 2005. Retrieved July 19, 2013. ^ a b c "Forza Motorsport 6 NASCAR Expansion". Forza Motorsport. May 17, 2016. Retrieved May 17, 2016. ^ "Forza Motorsport 6 NASCAR Expansion released on Xbox One". NASCAR. May 17, 2016. Retrieved May 17, 2016. ^ "Jimmie Johnson – 2001 NASCAR Winston Cup Series Results". Racing-Reference. USA Today Sports Media Group. Retrieved October 26, 2014. ^ "Jimmie Johnson – 2002 NASCAR Winston Cup Series Results". Racing-Reference. USA Today Sports Media Group. Retrieved October 26, 2014. ^ "Jimmie Johnson – 2003 NASCAR Winston Cup Series Results". Racing-Reference. USA Today Sports Media Group. Retrieved October 26, 2014. ^ "Jimmie Johnson – 2004 NASCAR Nextel Cup Series Results". Racing-Reference. USA Today Sports Media Group. Retrieved October 26, 2014. ^ "Jimmie Johnson – 2005 NASCAR Nextel Cup Series Results". Racing-Reference. USA Today Sports Media Group. Retrieved October 26, 2014. ^ "Jimmie Johnson – 2006 NASCAR Nextel Cup Series Results". Racing-Reference. USA Today Sports Media Group. Retrieved October 26, 2014. ^ "Jimmie Johnson – 2007 NASCAR Nextel Cup Series Results". Racing-Reference. USA Today Sports Media Group. Retrieved October 26, 2014. ^ "Jimmie Johnson – 2008 NASCAR Sprint Cup Series Results". Racing-Reference. USA Today Sports Media Group. Retrieved October 26, 2014. ^ "Jimmie Johnson – 2009 NASCAR Sprint Cup Series Results". Racing-Reference. USA Today Sports Media Group. Retrieved October 26, 2014. ^ "Jimmie Johnson – 2010 NASCAR Sprint Cup Series Results". Racing-Reference. USA Today Sports Media Group. Retrieved October 26, 2014. ^ "Jimmie Johnson – 2014 NASCAR Sprint Cup Series Results". Racing-Reference. USA Today Sports Media Group. Retrieved October 26, 2014. ^ "Jimmie Johnson – 2015 NASCAR Sprint Cup Series Results". Racing-Reference. USA Today Sports Media Group. Retrieved March 2, 2015. ^ "Jimmie Johnson – 2016 NASCAR Sprint Cup Series Results". Racing-Reference. USA Today Sports Media Group. Retrieved December 12, 2017. ^ "Jimmie Johnson – 2017 Monster Energy NASCAR Cup Results". Racing-Reference. USA Today Sports Media Group. Retrieved December 12, 2017. ^ "Jimmie Johnson – 2018 Monster Energy NASCAR Cup Results". Racing-Reference. USA Today Sports Media Group. Retrieved November 21, 2018. ^ "Jimmie Johnson – 2019 Monster Energy NASCAR Cup Results". Racing-Reference. USA Today Sports Media Group. Retrieved February 17, 2019. ^ "Jimmie Johnson – 1998 NASCAR Busch Grand National Series Results". Racing-Reference. USA Today Sports Media Group. Retrieved January 18, 2015. ^ "Jimmie Johnson – 1999 NASCAR Busch Grand National Series Results". Racing-Reference. USA Today Sports Media Group. Retrieved January 18, 2015. ^ "Jimmie Johnson – 2000 NASCAR Busch Grand National Series Results". Racing-Reference. USA Today Sports Media Group. Retrieved January 18, 2015. ^ "Jimmie Johnson – 2001 NASCAR Busch Grand National Series Results". Racing-Reference. USA Today Sports Media Group. Retrieved January 18, 2015. ^ "Jimmie Johnson – 2004 NASCAR Busch Series Results". Racing-Reference. USA Today Sports Media Group. Retrieved January 18, 2015. ^ "Jimmie Johnson – 2005 NASCAR Busch Series Results". Racing-Reference. USA Today Sports Media Group. Retrieved January 18, 2015. ^ "Jimmie Johnson – 2006 NASCAR Busch Series Results". Racing-Reference. USA Today Sports Media Group. Retrieved January 18, 2015. ^ "Jimmie Johnson – 2007 NASCAR Busch Series Results". Racing-Reference. USA Today Sports Media Group. Retrieved January 18, 2015. ^ "Jimmie Johnson – 2008 NASCAR Nationwide Series Results". Racing-Reference. USA Today Sports Media Group. Retrieved January 18, 2015. ^ "Jimmie Johnson – 2011 NASCAR Nationwide Series Results". Racing-Reference. USA Today Sports Media Group. Retrieved January 18, 2015. ^ "Jimmie Johnson – 2013 NASCAR Nationwide Series Results". Racing-Reference. USA Today Sports Media Group. Retrieved January 18, 2015. ^ "Jimmie Johnson – 2008 NASCAR Craftsman Truck Series Results". Racing-Reference. USA Today Sports Media Group. Retrieved October 26, 2014. Johnson, Jimmie; Chandra Johnson (2012). On the Road. Self-published. ISBN 0-615-65800-8.